The Thomas Merton Society – Grand Rapids chapter was started by Bill and Beth Murphy, two members of the International Thomas Merton Society. Bill was the recipient of a Shannon Fellowship to conduct research at the Merton Center at Bellarmine University in Louisville, Kentucky. From there, it was a short drive to the Abbey of Our Lady of Gethsenami, where he interviewed Br. Paul Quenon (a former student of Fr. Louis’) for The Only Love Project web site, visited Fr. Louis’ Hermitage…and got the bug. He knew he needed to return to the Abbey – soon. 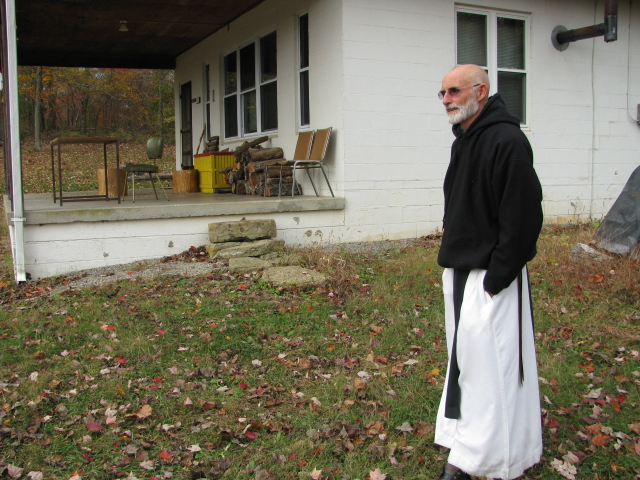 So Bill booked a week-long silent retreat at Gethsemani for the fall of 2015. It was like nothing else he had ever experienced. Life changing is too cliched a term. But that’s precisely what it was. Bill plans to enjoy another week-long retreat at the monastery in early May, 2016. NOTE: Substitute @ for (at) and . for [dot] and you should be good to go. Image on the left of the white building (Fr. Louis’ Hermitage): Bill Murphy. 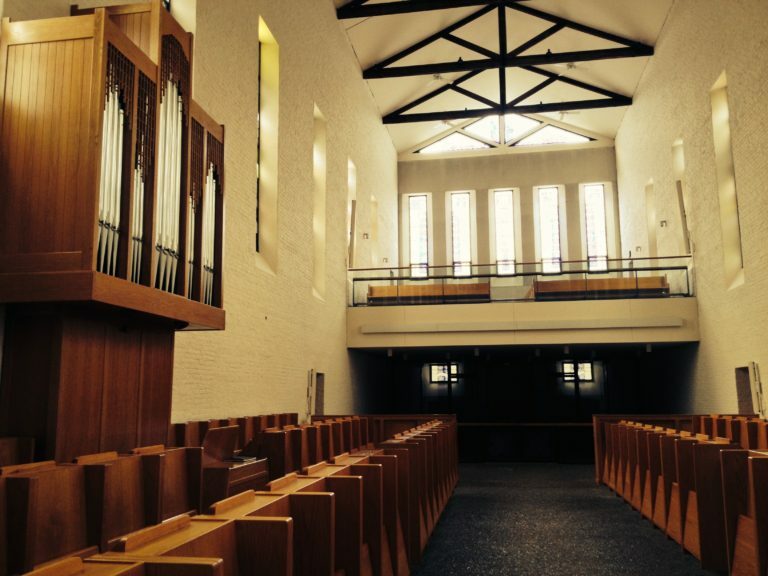 Image on the right of the monks in the sanctuary at Gethsemani: Bill Murphy. Image of Fr. Louis in the middle: Sibylle Akers, 1958. Copyright the Thomas Merton Center. Used with Permission. Stone statue overlooking Gethsemani on a nearby hill. Stone sign at the entrance to the monastery. Image of Fr. Louis’ marker in the courtyard on the cafeteria side of the monastery. Br. Paul Quenon reading from a book of Merton’s letters, in Fr. Louis’ Hermitage. The passage Br. Paul chose was as close to the date of Merton’s letter as possible, probably within a day or two. His reading of Fr. Louis’ words gave me chills. Merton’s prayer room in the Hermitage. The living room in the Hermitage. A fraction of the Merton books I own. The plaque outside the retreatant’s entrance to Gethsemani. The Rule of St. Benedict is the foundation for the Cistercian way of life, as well as other Catholic Orders (Benedictine and Franciscan). Even some Zen monks are adopting a form of the Rule of St. Benedict to govern their daily lives. Br. Paul Quenon outside Fr. Louis’ Hermitage. He was giving me a wonderful tour. The sanctuary, where the monks worship, looking back toward the visitor’s gallery and the balcony. This was taken on the tour Br. Paul gave me.